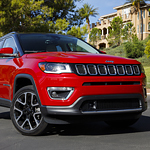 When you’re searching for a popular compact SUV in Winnipeg, the Jeep Compass should be at the top of your list. This vehicle has sleek curves while also having a rugged side. One of the first things you’ll notice is that the Jeep Compass maintains some of its signature stylings. This includes a seven-slot grille in the front. There are also trapezoidal wheel arches that are an element found within every Jeep model. Many Jeep Compass models can become trail ready in a matter of moments. With the Trailhawk trim level, you can have front and rear tow hooks and more for a rugged adventure. Another aspect of the exterior is personalization. You can choose from a total of eight wheel options, including polished aluminum alloy wheels in gloss black or tech gray. The lighting on the headlamps and tail lamps can be halogen or LED based on your personal preferences.